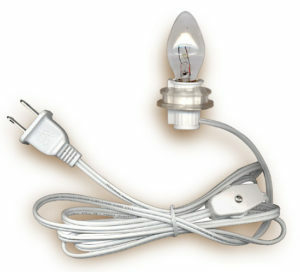 Light Cord with candelabra base LIGHT BULB provide everything in one convenient package to light your project. Includes clear, steady-burning light bulb. Cords also have switch to turn your project on and off. Easy to install. You just have to insert a bulb, plug it in and BAM your light is working! Long Cord: Our pendant light’s cord is 15 feet long allowing for full customization based on your needs and style. Stylish: These cords could be used in every environment. They could be hung straight down from the ceiling, dangling from artwork or draped on any pole.